Finding Josephine | The search for my family history which began at age 12 when I asked a simple question: "Grandpa, are you white?" Thanks for visiting Finding Josephine. We’ve moved. Come visit us at www.findingjosephine.com or www.dionneford.com where the journey into my family’s history continues. If you subscribed at dionneford.wordpress.com, you may have to sign up again at the new address. Sorry for any inconvenience. Please note that everything you see here is copyright protected. If you like it enough to reproduce it, please ask permission first. My cousin, Monique made this pillow for me as a Christmas/Kwanzaa/New Year's gift. It displays our ancestor Tempy Burton's 1891 newspaper ad, looking for her family whom she had been separated from by slavery. During our New Year get together while the kids were busy playing Wii, Monique and I poured over the book "History of Queen Anne County" by Frederick Emory. It's full of information about our Stuart ancestors during their time in Chestertown, Maryland. Yesterday, Christmas showed up a little early and in my email. That seems to be the way I get all of my best genealogy-related surprises. 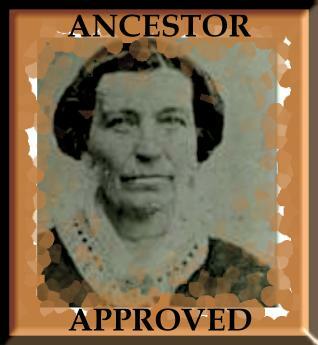 First, a third cousin, once removed shows up in my ancestry.com email a year and a half ago and jump-starts my ancestry research with her common obsession and appreciation for all things “relative.” A year later, a complete stranger emails said cousin and me information about a third great-grandmother we didn’t even know existed, helping us reclaim another generation of our family’s tree. Then last night, a fellow geneablogger I haven’t “met” yet named Yvonne posted a comment on my blog, congratulating me on the nomination which then showed up in my email. “What nomination?” I wondered. Between my daughters’ swim practices and meets, Holiday Pageant rehearsals, PTA meetings, a book proposal that I’m writing, and Christmas shopping that mocks me from my ever-increasing list of things to do, I’m a little out of the loop. Then I remembered. Last month, my cousin, Monique sent me an email saying she’d nominated Finding Josephine for Family Tree Magazine’s 40 Best Genealogy Blogs. And I love finding out whatever I can about them, discovering new members of my extended tribe, and sharing what I find and how I find it with all of you. You can vote for Finding Josephine or any of the other hundred plus nominees at http://www.surveymonkey.com/s/ft40-2011voting. Treasure Chest Thursday: Thanks to Ancestry.com, Another Cousin, Found! Meet cousin Sylvia Smith Isabel. She lives a short bus or train ride away in New York and is as passionate about uncovering our family’s history as Monique and I. The ancestors that all three of us have in common are Tempy Burton and Col. W.R. Stuart, aka The Colonel. Tempy was a slave in Elizabeth McCauley’s family. When Elizabeth married the Colonel, Tempy was given to the couple as a wedding gift. Elizabeth couldn’t have any children but Tempy could and did have seven, probably all with The Colonel. But two of her children were definitely The Colonel’s, documented through their death certificates. They were Alfred Burton Stuart, Tempy and The Colonel’s oldest child and Josephine Burton Ford, their youngest child. Alfred was Monique’s great, great-grandfather and Sylvia’s great-grandfather. Josephine Burton Ford was my great-grandmother. Using the cousin calculator that makes Sylvia and Monique first cousins, once removed, Monique and I third cousins, once removed and Sylvia and I plain ole third cousins. Two days after Thanksgiving, Monique and her family came over to our house and we had a few good hours of laughs over all the things we’ve found this past year and we were feeling pretty thankful, like we’d reached the peak of our genealogy mountain and could just take in the view. Then, two days later, with the discovery of Sylvia, we had even more to be thankful for, and more history to uncover (her dad grew up on Alfred’s farm and told her stories of Alf working as an unofficial town vet – news to us!). It feels like we’re at the beginning of another journey. Check out the other cousin we found earlier this year, Renee Smith. Gordon Kurtti was my husband’s younger brother. He died in 1987 at age 27 from AIDS. Although we never met, I always feel as if we did. I pass a picture of him putting pearls around his sister’s neck on her wedding day whenever I go up or down my stairs. The painting he drew of two muscular legs in third position are a focal point of our living room. At family get-togethers, there is always some funny Gordon story to tell. I feel as if I know his tastes and understand his sensibility from all the times I’ve heard my husband say, “Gordon would have liked that” while we’re watching a movie or visiting a museum or “Gordon would have liked you” when my daughters draw something particularly outstanding or tell silly jokes. By all accounts, Gordon was talented and funny and I can attest to the fact that he is not forgotten, but is sorely missed. I remember him and miss him and I never even met him. A memorial to Gordon appears above on the AIDS Memorial Quilt which is always on tour around the world but can also be viewed online at http://www.aidsquilt.org. How fitting that today, World AIDS day, comes within a week of the announcement that the drug, Truvada, may help prevent AIDS. The handsome Kurtti brothers, Gordon and Dennis. View from the Slave Burial Ground, Sweet Briar College, Amherst, VA. While at the Virginia Center for the Creative Arts, I’ve had the chance to visit the slave burial grounds at nearby Sweet Briar College. Over the years that I’ve been coming to the VCCA to write, I became aware of the grounds and was happy to learn that they were being preserved. Sweet Briar College was once a plantation and dozens of enslaved people are buried there. Thanks to the work of a team of preservationists headed by Dr. Lynn Rainville, these grounds are safe from disappearing and another descendant is closer to finding their ancestor. Rainville, a research anthropologist and historian at Sweet Briar College, received a grant earlier this year from the National Endowment for the Humanities to develop the African American Family Database. The project is a model for researching African-American families from antebellum to post-bellum times and when completed will help descendants find their enslaved ancestors.